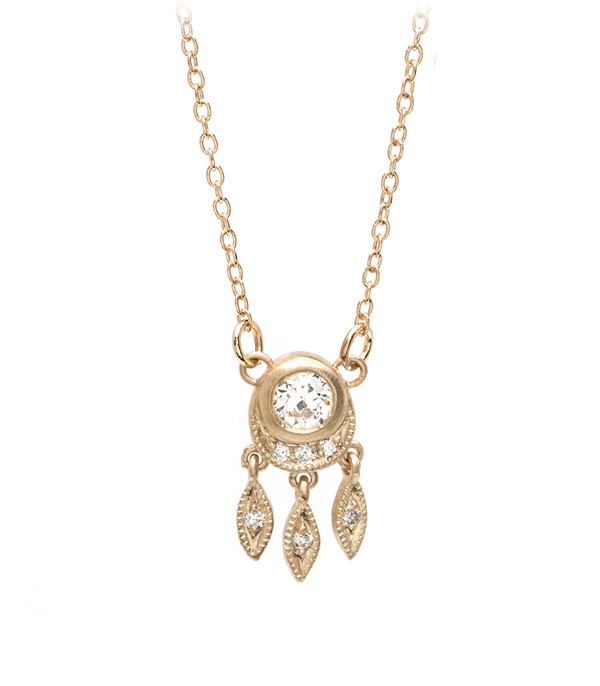 Inspired by the magic of a dream catcher and a hint of vintage charm, this bohemian diamond necklace is certain to become the most coveted necklace in your Sofia Kaman jewelry collection. We know fringe is an essential part of every Bohemian’s closet and our favorite kind of fringe just happens to involve diamonds. Dangling diamond-studded marquis shaped drops sway from an Old European cut diamond center, accented by a crescent of pave set diamonds. This diamond necklace is the perfect piece for someone who loves a tiny bit of drama and lot of sparkle, a perfectly lovely layering necklace or an romantic centerpiece for the dreamy boho bride. This vintage and bohemian inspired diamond necklace is set with 0.25 ctw of sparkling diamonds and handcrafted by our artisan jewelers in Los Angeles. Categories: Alethea, Bohemian Elegance, Necklaces.